WORLD-RENOWNED mentalist and magician Keith Barry will be coming to the Black Box in February 2018 with his brand new show Magic Madhouse which promises to be a hilarious mix of magic, mentalism and mayhem. On Tuesday, Barry paid a flying visit to Galway and I caught up with him to chat about his career in magic and what audiences can expect from the new show. I began by asking how 2017 was in ‘Barrytown’; “I toured my Hypnomagic show and did a lot of corporate work but also, after 20 years of being on the road, I got a decent amount of downtime so went fishing, I took the kids on holidays which was great,” he replies. Barry’s passion for magic was triggered in childhood by receiving presents of magic sets. “I got a Paul Daniels magic set when I was five. That was my first stepping stone into the world of magic,” he recalls. “Every year after that I’d get a magic set for my birthday or Christmas. When I was 14, on a school tour to Scotland, I got a really good book called The Klutz Book of Magic and that was what really made me consider it as an artform and as something I wanted to do for the rest of my life. Barry has cited Irish hypnotist and entertainer Paul Goldin as a key influence on his career. “When I was 14 Paul Goldin came to my hometown of Waterford; he was the foremost hypnotist in Ireland for many years. That was the first and only time I was hypnotised by him on his show. I ended up as the star of the show and I took inspiration from that. While Barry’s stage shows are all about entertainment he is a voracious reader on all things to do with the human mind. “A lot of people don’t know how to tap into their subconscious mind which is what hypnosis is,” he observes. “All hypnosis is really self-hypnosis so when I relax somebody down there is a three-stage process; you relax the physical body down then the conscious mind and then you can bypass that and re-programme what is going on at the subconscious level. "Now, when you are doing that, it ignites parts of your brain that are dormant because we don’t exercise our brain. The problem I see with ‘mindfulness’ that people talk about a lot is I don’t see a source of action; we have to work with mindfulness and exercise our brains, it’s a muscle and most people don’t – they do it in college but then they don’t even read which is simple. They don’t know how to take control of their subconscious brain. I have a passion for research and voraciously read anything that can benefit me or my life. "I’m currently following a guy called Wim Hof who is known as ‘The Ice Man’ and has 23 world records and has an amazing immune system where he was injected with toxins but they had no effect on him. His whole thing is a breathing technique coupled with cold exposure plus yoga which is amazing for your body and it activates parts of the brain that are not normally activated. When they are activated dopamine is released into the system which is a feel-good hormone and I can lie in bed and spread dopamine into my body just by thinking certain thoughts and doing certain exercises; anyone can do that. Barry personally coached Woody Harrelson in magic and hypnotism techniques for the films Now You See Me and Now You See Me 2 and the Hollywood star proved a gifted pupil. Can anyone acquire hypnotism skills, I enquire? Keith concludes our chat by outlining what Galway audiences can look forward to in his new show Magic Madhouse. “In the last couple of years I have delved deeply into mentalism and brain hacking and hypnosis in my last few shows and I want to make sure that my shows don’t become formulaic. I realised I hadn’t done any magic tricks in my shows for over 10 years so I am putting visual comedy and magic back into Magic Madhouse. The whole night will be crazy, even I won’t know what will happen half the time! "The routines are designed to make people laugh their heads off and then be fooled as well. There is also some hypnosis in there as well, but not the slapstick style I have done before – for instance I will hypnotise someone to have an out-of-body experience which will be fascinating to watch. The show will also have escapology which I haven’t done in a long time as well. I’m getting a metal straitjacket made and a bullet-proof Perspex box so that if the trick goes wrong my team won’t be able to break it. 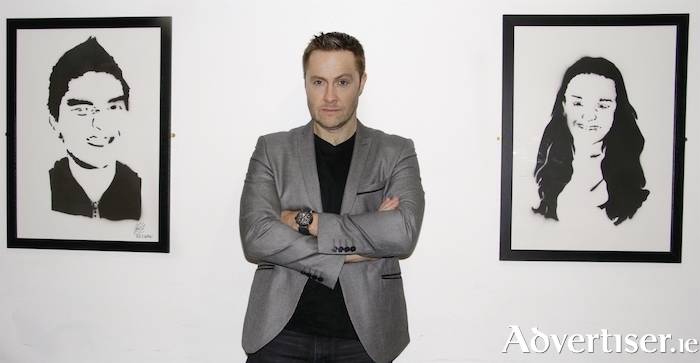 Keith Barry’s Magic Madhouse is at the Black Box for two nights only, on Friday February 23 and Saturday 24 at 8pm. For tickets contact the Town Hall Theatre (091 - 569777, www.tht.ie ).